[192 Pages Report] MarketsandMarkets expects the freight transportation management market to grow from $15.30 billion in 2014 to $23.69 billion by 2019 at an estimated CAGR of 9.14% from 2014 to 2019. With transportation networks becoming more global and complex in nature, the demand of freight transportation management systems is rapidly growing. The efficient movement of freight is essential to any economy and to the quality of life. Introducing a cost-effective fright transportation management system supports small and local players to compete proficiently at the global arena. Various kinds of technologies are been used to improve the performance of freight networks. Government agencies and industry leaders use terms such as freight optimization, route planning, order management, fuel management and vendor management to express the system that are used in the freight transportation management. Due to the growing demand, the freight transportation management system products set to improve with new forms of optimization, enhancements, mobility and better analytics. Increase in the number of trade blocks and international trade has grown the demand for the freight transportation management related solution and services. On-time delivery has become a critical success factor for the logistics industry and thus innovation in the solution for managing the transportation process has been a prime necessity for this industry. Transportation occupies one-third of the amount in the logistics costs and freight transportation management influences the performance of logistics system hugely. The current technological implication of new advanced age of information technology and communication innovations in the freight industry is transforming to provide more modernized freight solutions. The increase in number of transportation vehicles globally with major boom in the adaption of technology indicates the upcoming business opportunities for freight transportation management solutions. Also, the environmental concerns, security and safety of freight operations, need for operational efficiencies are expected to serve as a major drivers for freight transportation management market. However, the market is witnessing accelerated growth in recent years due to the advancements in cloud computing, big data and mobility services. This research study also aims at elaborating on the aspects, issues and trends governing the shift towards cloud. Transportation is the most important economic activity among the components of the business logistics and SCM system. As the, transportation plays a connective role among the several steps that result in the conversion of raw material into the finished good which is then delivered to the ultimate consumer. Hence, demand for the freight industry is increasing due to increase in import and export products which is than contributing towards growth of freight transportation management market. The efficient management of freight, an advanced freight management system is thus introduced as the solution and service for the management of global freight transport industry for better management and operations. Information and communication is considered as an enabling tool for having safe and efficient operations for freight transportation. In this report, the freight transportation management market is segmented into freight transportation cost management, freight security and monitoring system, freight mobility solution, freight management solution, freight information management solution, freight 3pl solutions and warehouse management system. Freight transportation management constitute of solutions that are used in inbound operations as well as outbound operations. On one hand, order management, dock scheduling, and freight audit and payment are the solutions that form a part of inbound operations. On the other hand, route scheduling, and optimization solution compose the outbound operations. Freight transportation cost management solutions become very important when efficient movement of goods become a priority and thus consists of route optimization, and fuel management. Freight security and monitoring solutions are segmented into cargo tracking, access control, video surveillance, intrusion detection and others that are needed for a continuous security between the carrier and the shipper in order to reduce the loss and theft of cargo. MarketsandMarkets expects the freight transportation management market to grow from $15.30 billion in 2014 to $23.69 billion by 2019 at an estimated CAGR of 9.14% from 2014 to 2019. 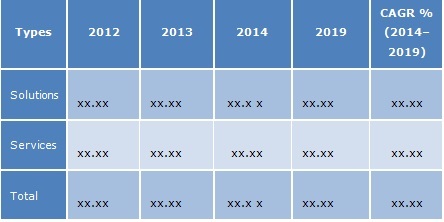 The table given above highlights the transportation management market revenue on the basis of types, from 2014 to 2019.